Another 15 bike commutes and another 661 1/2 miles are in the books. I switched back to Big Nellie for 10 of my commutes. (I am getting closer to another big mileage milestone.) Little Nellie came in handy for 4 other rainy commutes as well as a bimodal one. I rode to the office in the morning, then to my wife’s office in the evening. Little Nellie folded up into the trunk of her car and we spent the night watching Carlos Santana do his guitar tricks. My long ride for the month came on the Cross Check. It was 69 miles. I also used the Cross Check to ride to two Nationals games. Both were wins, the second one lasting 16 innings allowing me to ride home in the dark. For the year to date, I have ridden to work 59 times for a total of 1,744.5 miles. Errands and fun rides accounted for another 547.5 miles for a total of 2,292 miles. The Mule has the most miles (967.5) by far but I didn’t ride it at all in April. I threw in my first hike of the year, an easy one on the AT just off I-66. As soon as the ground dries I need to get out there and do another. I have been struggling with my riding for most of the winter. I just couldn’t get into a flow, my mechanics were a mess. In the last week of April, this started to change. I’ve noticed a big difference this week. I am riding much faster than I have since last summer. I hope I can build on this so that I can have a fun tour later this summer. 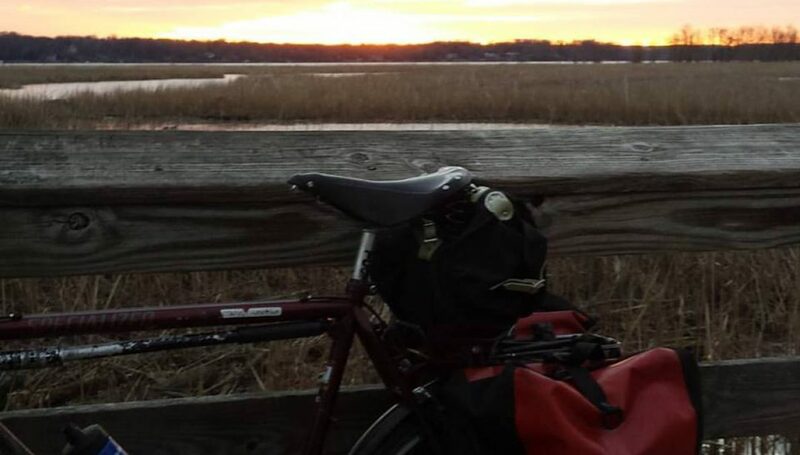 Posted on May 7, 2016 May 7, 2016 by rootchopperPosted in #bikedcTagged bike commuting. Good Stuff, Rootchopper! When are you planning to come up to the Adirondacks? Plan is to do Michigan instead in ’16. Sorry. Oh oops! I do remember you mentioning that now, sorry for the brain fart 🙂 Can I blame it on my upcoming tour? Because I have been forgetting a lot of things lately, its embarrassing. Today at work I called a coworker’s baby by his middle name…. Just go with the flow. You’ll have a blast. How can you not? You get to eat all the ice cream you want! It isn’t a race just a massive ride for fun. You should do one! In all seriousness, be mindful of your food intake. Bonking is no fun. I lose a weight fast when touring. That’s a reminder I really need, Rootchopper. Right now, I am a quite active person and I have been losing weight slowly and steadily over the past four-ish years. But here’s the thing, I am around food all the time! I cook as my job, I am constantly cooking for friends and family, food is a 24/7 thing for me. Now suddenly I am going to go from being a rather active person to being a VERY active person but my access to food is going to drop way down…I need to be very careful about making sure I eat enough food. You may even want to remind me again mid-tour, it would stink to have a bad experience simply because I am not eating enough food!